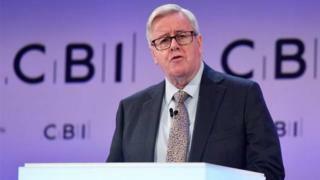 The president of business organisation, the CBI, has said if politicians cannot "get their act together" on Brexit, then the only other option is to "go back to the people". Speaking to the BBC Mr Allan said it was "astonishing" that 27 European countries could agree a "lot more readily" than UK politicians. MPs should "take a lesson" from European solidarity, he said. "But my personal view is if the politicians can't get their act together and get to an agreement the only other option is to go back to the people and have a second referendum to see whether people still feel the same way now that they did almost three years ago and resolve it that way. "One way or the other we have just got to break out of this impasse that we've got at the moment and get agreement. In a thinly veiled warning to MPs he said: "It's astonishing that 27 European countries can agree on things a lot more readily than, frankly, our politicians. They should actually take a lesson from the solidarity the Europeans have shown over the last couple of years." Mr Allan said politicians needed to put their "prejudices behind them", and try to find a settlement in an "open-minded way". "I think it would be great to erase red lines and for people to start thinking about the national interest as opposed to party interests or, as I think some politicians have been doing, their own personal self-interests." The withdrawal agreement was "non-negotiable", he said, adding that MPs had three choices: First, a no deal, which would be "extremely damaging to the UK economy. I can't believe any sane politicians would like to do that"; second, a compromise that a majority of MPs can agree on; third, revoke Article 50. "Those are the only three options and it shouldn't take our politicians too long if they tackle it positively and sincerely to get to a solution to that." Director General Carolyn Fairbairn, said the extension had averted "an imminent economic crisis". However, she added: "It needs to mark a fresh start. More of the same will just mean more chaos this autumn. "For the good of jobs and communities across the country, all political leaders must use the time well. Sincere cross-party collaboration must happen now to end this crisis." The British Chambers of Commerce said businesses would be relieved by the extension. "But their frustration with this seemingly endless political process is palpable," said director general Adam Marshall. "This extension buys Parliament some time to come to a consensus, but they can't afford to squander it. Politicians must urgently agree on a way forward. It would be a disaster for business confidence and investment if a similar late-night drama is played out yet again in October." At the Society of Motor Manufacturers and Traders chief executive Mike Hawes said it was "utterly unacceptable" that, more than two years since negotiations started, industry still did not know what the UK's relationship with the EU was going to be. "This cannot go on. Government and Parliament must use this extension purposefully to take no deal off the table for good, and guarantee a positive long-term resolution that delivers frictionless trade. "If they fail, we face yet another devastating no deal precipice on 31 October," he said.